It is one thing for big business to express concerns over the uncertainty the ongoing Brexit negotiations have created. It is quite another for someone like Cecilia Gragnani, who has spent a significant proportion of her adult life in the United Kingdom, to do so. Diary of an Expat suddenly gets rather dark, because in the aftermath of what is now referred to in some quarters simply as ‘That Referendum’, Gragnani has personally suffered racial and anti-immigrant abuse on a scale not previously encountered. “Where are you from?” is now, she explains, a loaded question. Born and raised in Italy, Gragnani describes herself as a proud Italian, and one who has come to love the United Kingdom to the point where she has become a British citizen. A discussion of the infamous Knowledge of Language and Life in the UK test throws up some interesting questions, opened up to the audience for us to attempt. Some are easy (“Who wrote ‘Pride and Prejudice’?”) while others are borderline ridiculous, such how many square metres a particular body of water is (my powers of recall are not strong enough to remember the exact question). An acquaintance who attended a Citizenship Ceremony told me that the speaker handing out the certificates said in his speech that he himself didn’t pass first time, so I could see where Gragnani was going as she continued to extract sample questions – sure enough, the Brits in the room were eventually left completely stumped. But this was more than outweighed than the feelings of confusion on her part as she adjusted to living in London, trying to grasp British English idioms and forms of greeting. When she speaks of “infinite space” she says it is such a way that it is difficult (at least for me) to decipher whether there’s a hint of sarcasm (my gut instinct tells me there is) or if it’s more of a reference to the relatively large area that constitutes Greater London – even if London doesn’t get ‘greater’ the further out one goes, but ‘lesser’. Gragnani has a very clear delivery, and good rapport with the audience, even if we were being rather British and thus reticent, at least in the first instance, to answering her questions. I’m pleased to have learnt a little more about Italian culture too – they have a saying over there: “Natale con i tuoi, Pasqua con chi vuoi”, which roughly translates ‘Christmas with your family, Easter with whoever you want’, which in practical terms means that it is expected Italians away from home return for Christmas – it is one day, and should be special and with family. As for London, Gragnani concludes it can be both Heaven and Hell in one – some people who come from overseas have ambitions not dissimilar to the American Dream, and Gragnani ponders on whether it is, after a while, time to downsize dreams, especially when one is older and wiser. A heartfelt and poignant production. 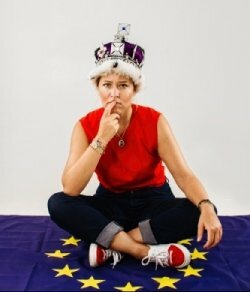 Diary of an Expat is a relevant and thought-provoking one-woman show, directed by Katharina Reinthaller (Labels, Fringe First Winner 2015), telling the comic story of the encounter between modern migrant Cecilia and London – a contemporary El Dorado craved by generations of young Europeans. When she arrived in the UK from Italy nine years ago, with a suitcase full of hopes, dreams and bags of pasta, Cecilia’s mission began – trying to become British whilst remaining deeply Italian. She started her exciting life abroad with thrilling adventures, a successful career and a vibrant urban lifestyle…kind of. Now, after numerous dubious jobs and weird encounters, Cecilia finds herself alone among the chaos of multi-ethnic, glamorous London whilst navigating the ever-present uncertainty of Brexit. Now turning her desires into reality has become a titanic endeavour as the European dream of life abroad slowly drifts away. Based on real testimonies as well as personal experiences of writer Cecilia Gragnani, Diary of an Expat looks at lives of Europeans abroad and their urgency to understand and explore what expatriating means for a younger generation. Confronting the legal technicalities of becoming a citizen of another country, Cecilia questions what role this will play on her identity and how we decide where we belong.